Half.com, founded in July 1999, was the brainchild of Joshua Kopelman and is now owned by eBay. He observed the insufficiencies of retailing in the area of used mass-market merchandise and went to work on developing a new outlet for secondhand merchandise. Kopelman’s site was so successful that eBay bought out Half.com after its first year of business in 2000 for roughly $350 million. Half.com ranks as one of the Internet’s most visited sites. Half.com currently lists millions of items, including books, CDs, DVDs, video games, and game systems. 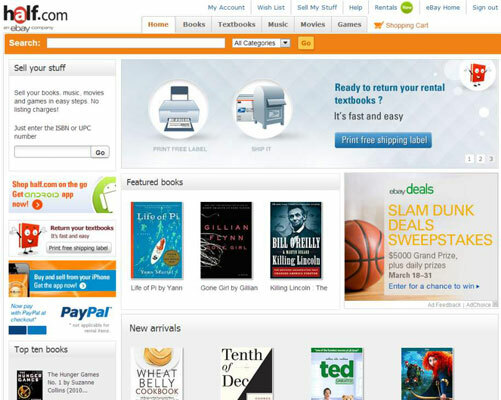 In a smart turn, Half.com recently added the capability for shoppers to rent textbooks. Because Half.com is part of eBay, your feedback follows you to the site. Selling at Half.com is different from selling at your eBay (or other online) store only because you’re selling in a head-to-head, fixed-price marketplace. Your item is listed against more of the same item from other sellers. Half.com isn’t a home for your store; you might say that each item has its own store, complete with competing sellers. The item listing is free. The item stays on the site until the item is sold or until you take it down. Just like your my eBay page, Half.com has a very user-friendly area where you can control your selling. You’ll find it under my Account: Inventory. You can change the prices for your books right there — no need to access individual listings! To list an item for sale at Half.com, you first need to locate the item’s Universal Product Code (UPC) or, if you’re selling a book, the International Standard Book Number (ISBN). In case you’re wondering what an ISBN is, turn this book over and find the bar code on the back. The number written above it is this book’s ISBN. If you don’t want to bring all your books, CDs, movies, or games to your computer so you have the UPC or ISBN handy, scan your items using an inexpensive handheld scanner (make sure it’s a model that holds the scans in memory). If you don’t have an item’s outer box with the UPC, search Half.com from any of its pages for your particular item (including its brand name). When your search comes up with the exact item, copy down the code number and use it with your listing, or click the Sell Your Stuff link on the item page. You’ll find that when you apply the UPC or ISBN in your listing, Half.com comes up with an image of your item, so you don’t even have to take a picture for your sale. When an item is out of print, Half.com may not have an image to upload with the listing. In this case, the text Image not available appears in the area where the picture would appear. Half.com has an amazing database of items in the books, music, movie, and video-game categories to help you find the specs of whatever item you want to list. But if your item doesn’t have a code, you can upload your own photo and even add a 1,000-word description. 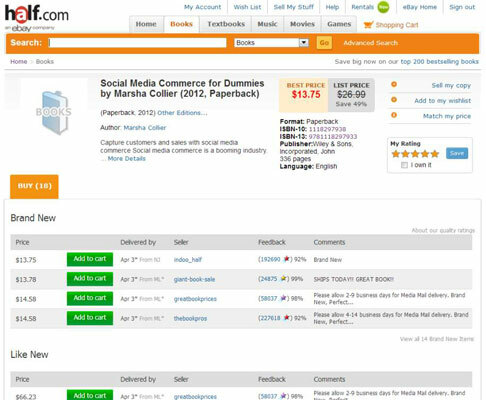 When someone searches on Half.com for an item, such as a book, a listing of all sellers who are selling that book appears. The listings are classified by the book’s condition — categorized as Like New or Very Good — depending on what the seller entered. The list price of the book is included, as well as a comparison of selling prices on the eBay site. Also, when a prospective buyer searches and finds a book or coded item, a box appears in the corner of the listing with a price comparison of the item from various other online sales sites. Half.com charges a commission after your item sells. Commissions for items sold in the Books, Music, Movies, Games, and Game System categories are a percentage of the selling price of the item. The shipping cost is not added to the selling price. Buyer buys your paperback, which is priced at $37.00. Half.com charges the buyer $3.99 for Media Mail shipping and handling costs. You pay Half.com a 15 percent commission, which is $5.55 on a $37.00 item. You get a shipping reimbursement of $2.64. Half.com sends you a net payment of $34.09.